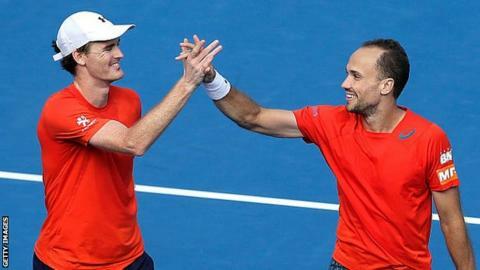 Britain's Jamie Murray and Brazil's Bruno Soares won the Apia International in Sydney with a straight-set victory over Rohan Bopanna and Florin Mergea. Scot Murray and his new men's doubles partner won 6-3 7-6 (8-6). They were playing only their second tournament together after Murray ended his partnership with John Peers. The pair won two matches on Friday to reach the final against India's Bopanna and Romanian Mergea because of a weather delay. The tournament is a warm-up event for the Australian Open, which begins in Melbourne on Monday. Serbia's Viktor Troicki, 29, retained his Apia International title with a 2-6 6-1 7-6 (9-7) victory over Grigor Dimitrov on Saturday. The two were meeting for the second time in as many weeks. On Friday, Russia's former US and French Open champion Svetlana Kuznetsova, 30, beat Puerto Rico's Monica Puig in the women's singles final 6-0 6-2. Petra Kvitova was unable to defend her title because of a stomach virus, while second seed Agnieszka Radwanska also withdrew because of a leg injury. Switzerland's Martina Hingis and India's Sania Mirza beat Caroline Garcia and Kristina Mladenovic of France 1-6 7-5 10-5 in the women's doubles final on Friday.